up on the face twenty or more years later. As we age, we may begin to notice that our skin is not as lustrous that it once was, that its color is splotchy and that spots are noticeable where the skin was once clear. Fine lines and wrinkles develop around the eyes, nose, and mouth, and pores can be seen with the naked eye. Correcting the issues that stem from sun damage is easier thanks to advances in laser technology. Using the Clear + Brilliant procedure, our team improves the sun damaged skin of our patients, providing a smoother and more radiant surface on the face, neck, arms, hands, and chest. When people are concerned about their appearance and become interested in improving the photodamage that has occurred throughout many years, it may be too late to restore the type of skin they enjoyed in their youth. Even with aggressive lasers, down time, and risks of scarring, these ablative laser resurfacing treatments cannot turn back the hands of time by decades. Rather than wait until damage has become impossible to ignore, it is easier to take the proactive approach of mildly resurfacing the skin. Fractional, non-ablative laser resurfacing with Fraxel Restore laser was begun in our NYC practice as one of the first three offices to perform this treatment. Over more than a decade, Dr. Ron Shelton has developed a great experience in providing facial resurfacing to many patients through the three major technological advances in the Fraxel Restore and Fraxel Dual devices. Now, Fraxel Clear + Brilliant and Permea are added to our array of rejuvenation methods. Fraxel Clear + Brilliant treatment is more comfortable than Fraxel Restore, or Fraxel Repair. Downtime for this procedure is shorter than what is needed for more ablative techniques, and results are beautiful. After treatment with one of our trained clinicians, the complexion brightens, skin looks smoother and more evenly toned, and pores may appear smaller. The Permea 1927nm. laser is used to lighten darker tones, brown sun damage and melisma. A series of laser treatments, often five to six, is easily performed, with minimal downtime after each session. It is possible to return to your normal daily activities, though there will be a bit of fine bronzing, like a slight sunburn, as well as light shedding of the skin. Makeup can be applied soon after treatment. This is because the microchannels that are created in the skin heal almost immediately. The sun damage then is allowed to heal internally. Clear + Brilliant is an excellent adjunct to the use of SkinMedica's Lytera and the collagen producer Alastin Restorative Cream, which has human fibroblast growth factors. Other topical solutions that are maximized through the assistance of skin rejuvenation with Clear + Brilliant include antioxidants. Remember, the use of sunscreen is crucial to maintaining the improvement you will obtain from rejuvenation procedures. In the hands of an experience aesthetic physician, your skin can glow. Contact our Mid-town Manhattan medical practice today to schedule your consultation. Clear and Brilliant Technology NYC - What is Clear and Brilliant technology and how does it help NYC residents improve their skin? 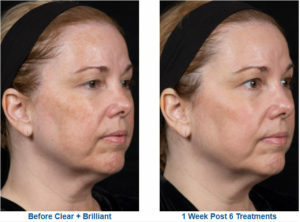 Clear and Brilliant After Results NYC - What results can NYC patients expect after Fraxel Laser, Clear and Brilliant treatment?